Today’s video pumpkin project is a spin off of a pumpkin tag I posted on my Facebook page earlier this week. The original was on display at convention, so all I had was a picture and no details. I wanted to recreate it, but I also wanted to make it a little bigger and turn it into a card. So I used the Circle Framelits and a cool technique on the Big Shot so it opens and you can write inside. The question is, is it a card, or is it a tag? You decide! GREAT NEWS! As of this morning the Magnetic Platform #130658 is back in my online store! My Clearance Rack has also been restocked, so be sure to check in there too for savings up to 80% OFF. So cute! I’m so glad I found your site. Love this card…………….I was looking for a card to send to my family and friends for Thanksgiving. What size envelope would I make? It’s approximate 6″, depending on how high you put your leaves maybe a hair more. Love the card .. a little alteration would make great placecards. So in love with your videos. They are very informative, and sweet and classy all at the same time. I would love to win your gift package no sure if you mail to Canada or not but… worth the chance. Any way still love your beautiful cards and I am sooo glad to have found you. Just watched this video and the pumpkin is so adorable! TFS! very cute card. I need to make some halloween something for my daughters class this might win. I’m just starting out and I love your videos. I’m learning so much. Thank you. Love the card and your videos!! Thanks for sharing this beautiful pumpkin! I am definetly going to make this. This is so neat…I like the idea for the Children to do when they make the place settings for Thanksgiving. Thanks for the idea!!! I loved the card when you posted it the other day I’m so glad you post the how to video. They would make cute home decor decorations as well. 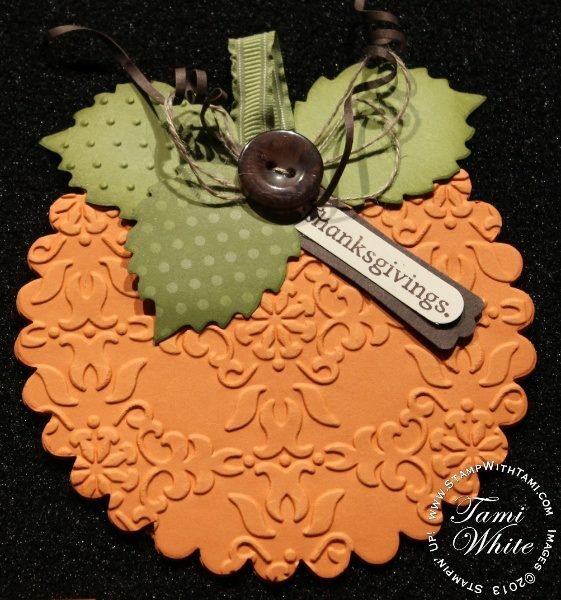 Great for a scrapbook page as well for when you go to the pumpkin patch. So *stinkin* cute, as you would say!! CONGRATS. on your HUGE accomplishment w/SU….what a fantastic job!!! Super cute! I am thinking of using this idea for a treat bag topper. I love this pumpkins. I like it!!! So cute. I just found you blog and love it. I will be visiting it daily. Thanks for the chance to win prizes. Love you videos…..so concise, yet packed with information and entertaining. Thanks for the inspiration. Love all your card ideas..thanks for sharing! Whether you make it as a tag or a card, I still love it! I am going to have to make this sometime soon. Our fall here in Iowa won’t be the prettiest this year so I am going to have to make lots of fun cards with leaves to stretch the season out! Thanks for the inspiration. I love your videos! I have been following your cardmaking on pinterest. I love your ideas and videos. Thank you. This card (tag) is super cute and I just love the big shot trick that makes the framelits even more versatile. Thank you for all the inspiration! Tami – you were right about this card being stinking cute! Thanks for the video! This pumpkin card is absolutely adorable!!! Cute-Cute-CUTE!!! Ack! Love it! Thank you for the inspiration!! Congrats on the recent milestone. Just recently found your blog and YouTube videos. Love them. Thanks for sharing your ideas with us. Wow..this card is super cute!! You are such a talented lady. I just love your designs! Such a neat project! Thanks for showing us how to make it! Love the use of embellishments! Love your u-tube videos and now your blog, learning lot’s! Thanks! This is a great trick because it can be used with other Framelits dies for all different kinds of shapes. And I forget sometimes how much character embossing folders can add to a project. Thanks for the great ideas! Love this card. Would make a nice name card for thanksgiving. Thanks for the Hugh give-a-way! So cute! Would make great place cards for Thanksgiving dinner. My great niece and nephew will love this card for Halloween or Thanksgiving. Can’t wait to make it. This is awesome! cute and simple to make. thanks for sharing. I love this pumpkin card. So “stinkin” cute!!! Thanks for sharing! Gosh, you are so right. This is so stinking cute! I have a pen pal at an inner city school and I am always looking for cards to make (especially since we’re not allowed to send even the tiniest of gifts) to brighten her day and encourage her. Instead of Happy Thanksgiving, I used “Happy Fall” (used my computer printer); instead of a button I just cut another acorn. I’m so pleased with how it turned out. I almost hate giving it away. 🙂 Thank you, once again for the idea and inspiration! Stinkin cute pumpkin! Perfect for sending fall/harvest wishes. I love this card!!!! I’m getting ready to make it myself!!! !